Cycle two abreast – this is against the law but still some do this where there is no yellow shoulder. Traffic lights – You MUST STOP please, show respect to other traffic and set the example. Hand signals – make eye contact with the motorist when entering a traffic circle and make clear signals to indicate your intentions. How often do we seen a quick finger shoot out and that’s all. Always wear a helmet – head injuries account for about 60% of the 800 cycling deaths annually. When cycling at night or in low light conditions wear a brightly coloured, reflective clothing and use your headlight which can be mounted on your handle bars or helmet. Also a good idea, a rear mounted RED strobe light. YOU can never be to visible. 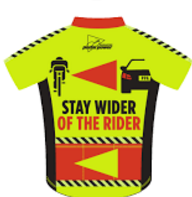 See and Be Seen – Wether cycling daytime, dawn, dusk, foul weather or at night, you need to be seen by others. Wearing white has not been shown to make you more visible. Rather wear and always wear neon, fluorescent, or other bright colors. Also wear something that reflects light, like reflective tape, flashing lights on your backpack/helmet. Just remember that because you can see the driver, does not mean the driver can see you. Don’t wear headphones !!! – they block out any ambient noise, you need to hear in order to cycle defensively. Single File – I spend many a kilometer on my road bike, and when two cyclist’s are over lapping their wheels this means you are not in single file and the larger the group the more chaotic it gets. Now think what a motorist who is approaching from behind sees. They are in a hurry to pass and then also pass on the solid white line which means you don’t have your 1m passing distance and with luck, they have oncoming traffic and cut into your group. NEED I SAY MORE..